Yet another 60s DIY project from The Practical Encyclopedia of Good Decorating and Home Improvement, Greystone Press, 1970. 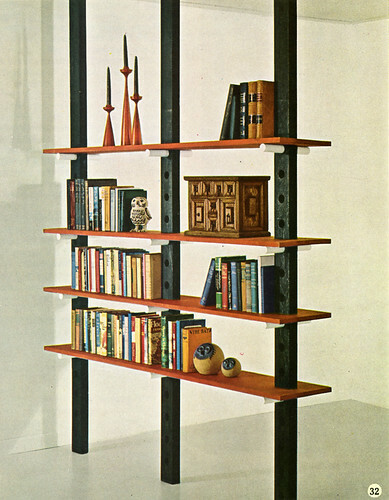 While the bookshelf directly above is cringe-worthy (almost in the “so bad it’s good” category, but not quite), it could be very mod if it were updated and re-made properly with more attractive materials. One advantage of pole shelving is that unlike wall-mounted shelving (previous post), you can bring it out from the wall and let it function as a room divider. If you do want to place it against a wall, the fact that it is anchored from floor to ceiling means that you don’t have to screw into the wall, either when you’re not allowed to alter the wall in a rental, or when your plaster wall is disintegrating and too weak to support heavy shelves. See some pole-mounted cado-style shelving here. The trick is to figure out how to anchor your poles—once you’ve done that, suspending the shelves is easy and there are many ways to do it. Some Apartment Therapy tips here and we found a blog called Pole Shelving which shows a number of styles and provides many links to tutorials. 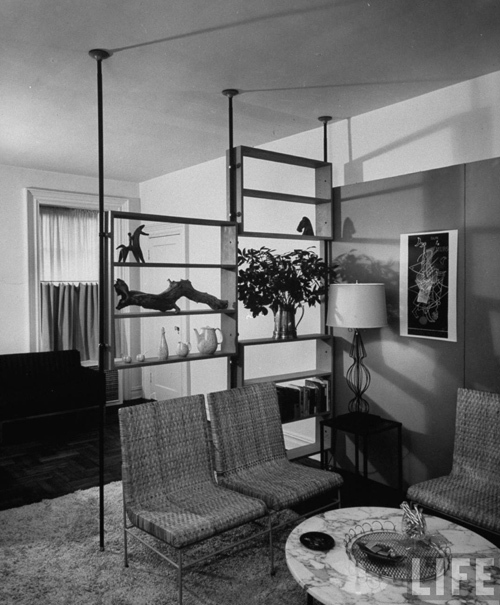 Below, from Time Life: aluminum poles used as room divider in New York apartment, has three pole shelves held on by clamps. Taken in December 1953 by photographer Peter Stackpole, the bookshelf cost $142.50 at the time and were made by a company called Polecats Inc. Rakks and ISS are two big current suppliers of these systems. But somehow the 50s example has a bit more style. Click below for a similar project but that uses boxes rather than flat boards, and comes with excellent DIY instructions. This entry was posted on Saturday, January 17th, 2009 at 5:37 pm	and is filed under design, DIY, furniture, interiors. You can follow any responses to this entry through the RSS 2.0 feed. You can leave a response, or trackback from your own site. I really love these 1950s room dividers. They can segment up a room wthout having to build solid walls. How practical is that?